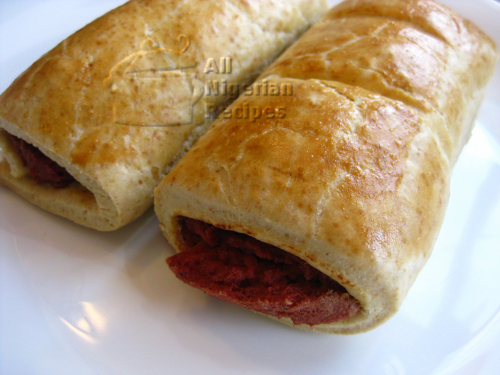 I have seen a lot of recipes for Sausage Rolls where a beef sausage is slapped on a dough, folded and baked. But that tastes too "sausagey" for my liking. I'll rather put the sausage in a bread roll and eat instead of wasting my time and electricity baking that in the oven. The number of Sausage Rolls you will get with the following ingredients depends on how flat you roll out your dough and the size you cut your sausage rolls during preparation. I don't like sausages because they are tasteless and salty. For this reason, I like to season sausages before using them in my Sausage Rolls. Boiling them with seasoning is never enough because the seasoning cannot penetrate the compact sausage. The following steps will show you how I season my sausages before using them. Put the sausages in a bowl and use a blunt object eg a pestle to mash them up. Crush the stock cubes with your fingers and add to the mashed sausages. At this time, feel free to add any other seasoning that catches your fancy. Stir well to mix the added ingredients with the mashed sausages. 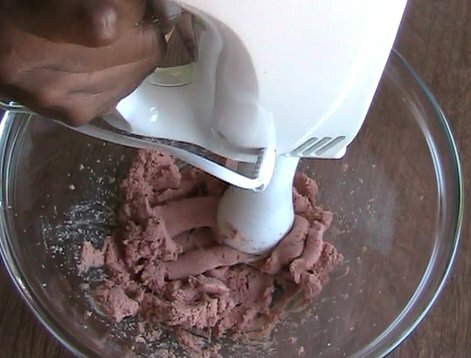 Use the hand blender to blend the sausages into a smooth paste. Put the flour in a sizeable bowl; add the baking powder and salt. Mix these dry ingredients very well. You really do not need a lot of salt for the sausage roll dough. Most sausages contain a lot of salt already. 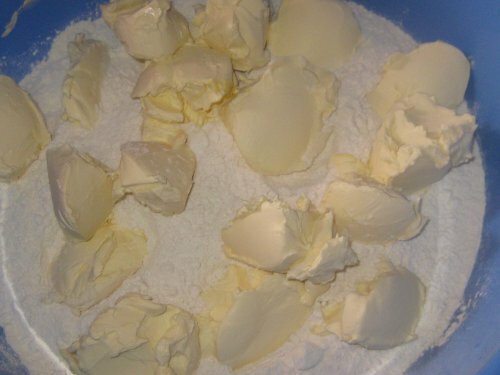 Use a tablespoon to scoop the margarine in small bits into the bowl of flour. The smaller you make the bits of margarine, the easier it will be for you to rub them into the flour. 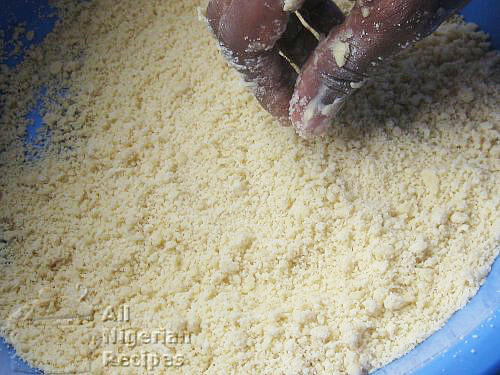 Use finger tips to rub the margarine into the flour till the mix becomes like crumbs. 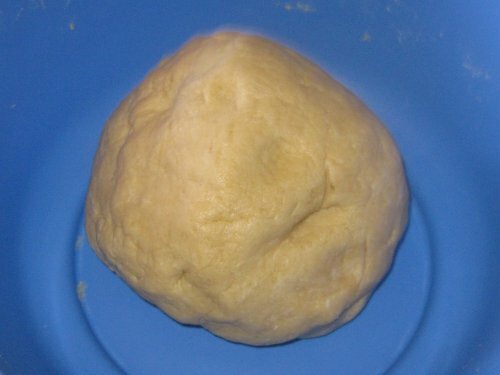 Add cold water in bits and mix till a stiff ball of dough is formed. You only need a small quantity of water for this to happen. Set your oven to 170°C (~335°F) to preheat while you continue with the sausage roll. Rub margarine on the insides of the oven tray, spray flour on it, pour out the excess flour and set aside. 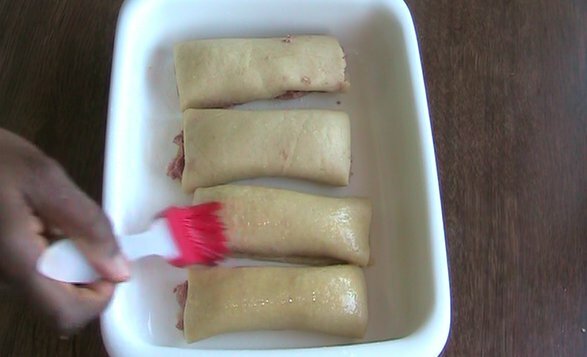 This is so that the undersides of the sausage rolls do not burn or stick to the tray during baking. Break the egg, beat it and set aside, you will need it later. Roll out the dough to a 3mm thickness. 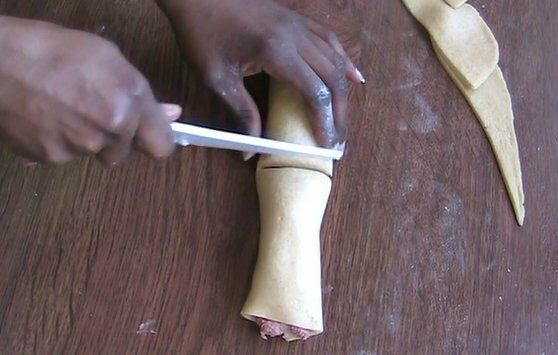 Use a blunt knife to make a rectangular cut on the rolled out dough. Remove the excess dough and rub the egg on the rectangular dough. Scoop some sausage along the edge of the length of the rectangle. 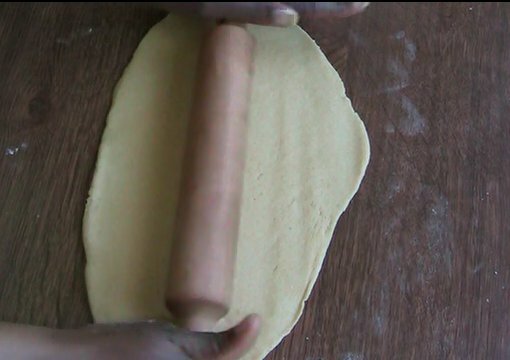 The thickness of the sausage should be such that you can comfortably fold the dough and still be left with an overlap. Watch the video below to see how I did that. 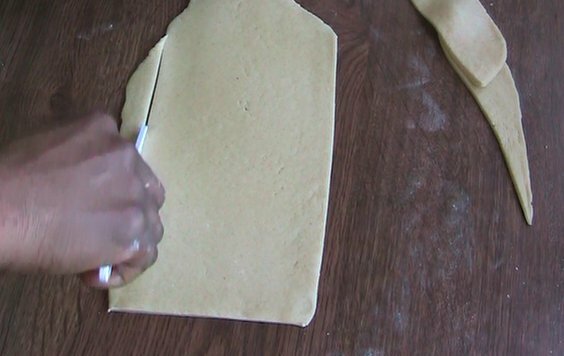 Fold the dough as you would fold a mat. 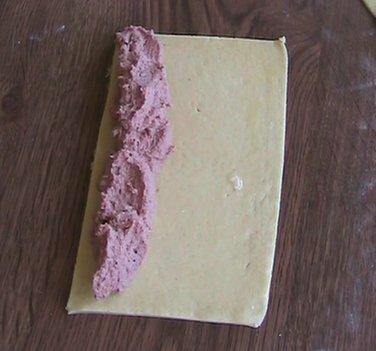 Rest the folded roll on the excess dough to make a seal like you would with the flap of an envelope. Cut the sausage roll to desired lengths. 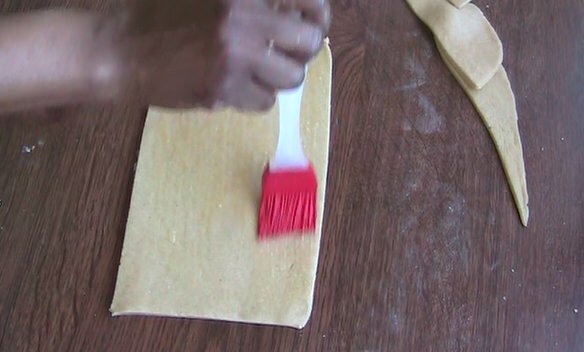 Roll out more dough, cut, fill, fold, cut into desired lengths and place in the greased oven tray till all the dough is used. Rub the egg on the sausage rolls. This gives them a golden brown look when done. Set the tray in the preheated oven and bake till the Sausage Rolls are golden brown. This should take approximately 40 minutes depending on the thickness of your dough and the type/heating capacity of your oven. 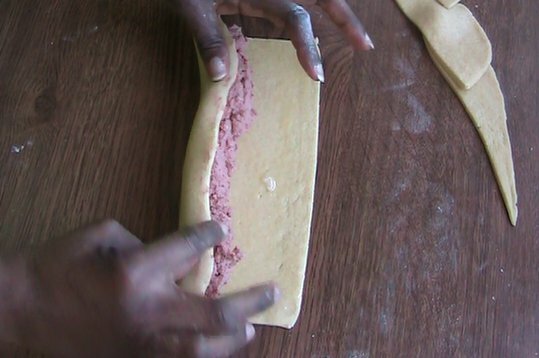 That's how to make the Nigerian Sausage Rolls that do not have the strong sausagey smell and taste.